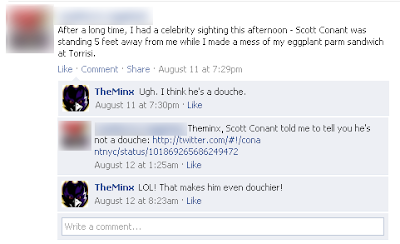 A blogger that I follow posted on Facebook and Twitter not long ago that she was thisclose to Conant. I told her that I think he's a douche. Conant himself responded on Twitter that she should "tell her friend I'm not a douche." After poking around his account for a few minutes, I noticed that he seems to enjoy re-Tweeting comments that disparage him. Maybe he gets off on it. He deleted his "tell your friend I'm not a douche" comment before I thought to screen-cap it. Guess he can't deny the truth. Since this is a food blog, I figured I should try one of his recipes before I trash talk him. Because I've read raves about his simple spaghetti with tomato and basil sauce, that seemed to be the dish to try. Mr Minx and I whipped it up one recent evening. Eh. It's fine. The sauce was so unctuous from the copious amounts of oil, butter, and starchy pasta water, the tomato provided merely an acidic accent that could also be achieved with a more reasonably-priced squeeze of lemon or dash of zest. It's almost criminal that this dish is listed on the Scarpetta menu at $24. Wait...what am I saying, "almost?" Definitely criminal. Personally, I think it would be tastier with more cheese, some shellfish, and chopped red onion. Add the olive oil to a pan and heat until it begins to smoke lightly. Add the tomatoes, salt, pepper, and red-pepper flakes, but take into consideration that the sauce will reduce and the salt will become concentrated. Crush the tomatoes with a potato masher to release all their liquid. Cook for 25 minutes over medium to medium-high heat, until the tomatoes form a semi-chunky sauce. Meanwhile, bring a pot of salted water to a boil and add the spaghetti. When it is three-quarters cooked, drain the pasta and reserve the water. Add the spaghetti to the sauce and cook over medium-high heat until all the liquid is absorbed and the pasta is al dente, stirring occasionally. 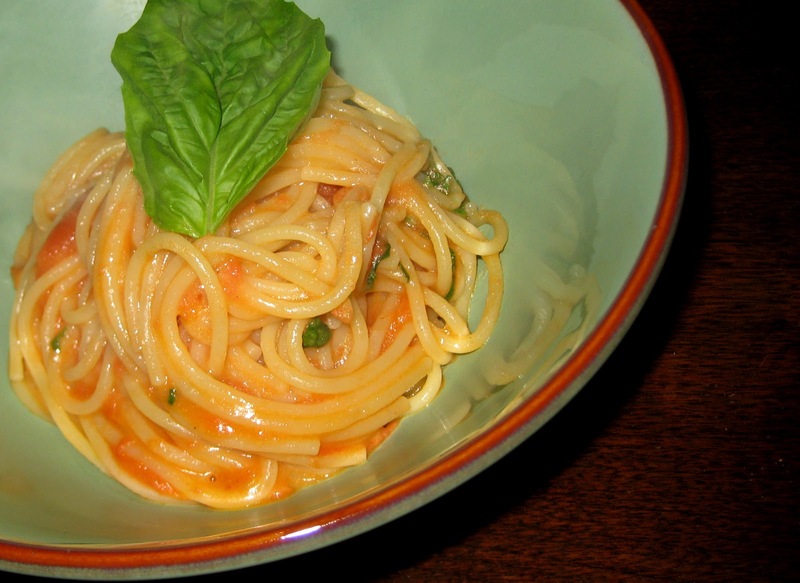 If the sauce becomes too thick, add a little of the pasta water to thin out the sauce. Remove from the heat, and, just before serving, add the butter, basil, and cheese, mixing thoroughly until the pasta is an orange hue. Season to taste with salt.